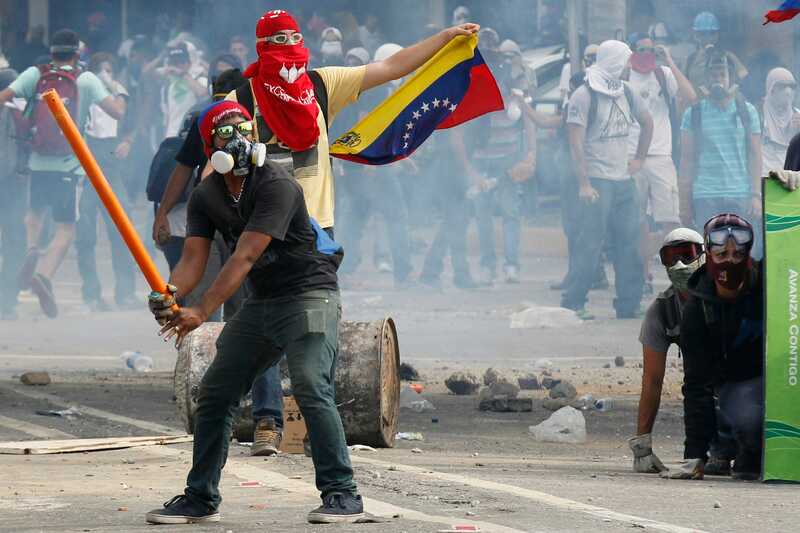 Anti-government demonstrators pretend to bat gas canisters to police during riots in Caracas April 1, 2014. The only question now is whether Venezuela's government or economy will completely collapse first. The key word there is "completely." Both are well into their death throes. Indeed, Venezuela's ruling party just lost congressional elections that gave the opposition a veto-proof majority, and it's hard to see that getting any better for them any time soon — or ever. Incumbents, after all, don't tend to do too well when, according to the International Monetary Fund, their economy shrinks 10 percent one year, an additional 6 percent the next, and inflation explodes to 720 percent. It's no wonder, then, that markets expect Venezuela to default on its debt in the very near future. The country is basically bankrupt. That's not an easy thing to do when you have the largest oil reserves in the world, but Venezuela has managed it. How? Well, a combination of bad luck and worse policies. The first step was when Hugo Chávez's socialist government started spending more money on the poor, with everything from two-cent gasoline to free housing. Now, there's nothing wrong with that — in fact, it's a good idea in general — but only as long as you actually, well, have the money to spend. And by 2005 or so, Venezuela didn't. Why not? The answer is that Chávez turned the state-owned oil company from being professionally run to being barely run. People who knew what they were doing were replaced with people who were loyal to the regime, and profits came out but new investment didn't go in. That last part was particularly bad, because Venezuela's extra-heavy crude needs to be blended or refined — neither of which is cheap — before it can be sold. So Venezuela just hasn't been able to churn out as much oil as it used to without upgraded or even maintained infrastructure. Specifically, oil production fell 25 percent between 1999 and 2013. The rest is a familiar tale of fiscal woe. Even triple-digit oil prices, as Justin Fox points out, weren't enough to keep Venezuela out of the red when it was spending more on its people but producing less crude. So it did what all poorly run states do when the money runs out: It printed some more. And by "some," I mean a lot, a lot more. That, in turn, became more "a lots" than you can count once oil started collapsing in mid-2014. The result of all this money-printing, as you can see below, is that Venezuela's currency has, by black market rates, lost 93 percent of its value in the past two years. It turns out Lenin was wrong. Debauching the currency is actually the best way to destroy the socialist, not the capitalist, system. Now you might have noticed that I talked about Venezuela's black market exchange rate. There's a good reason for that. Venezuela's government has tried to deny economic reality with price and currency controls. The idea was that it could stop inflation without having to stop printing money by telling businesses what they were allowed to charge, and then giving them dollars on cheap enough terms that they could actually afford to sell at those prices. The problem with that idea is that it's not profitable for unsubsidized companies to stock their shelves, and not profitable enough for subsidized ones to do so either when they can just sell their dollars in the black market instead of using them to import things. That's left Venezuela's supermarkets without enough food, its breweries without enough hops to make beer, and its factories without enough pulp to produce toilet paper. The only thing Venezuela is well-supplied with are lines. 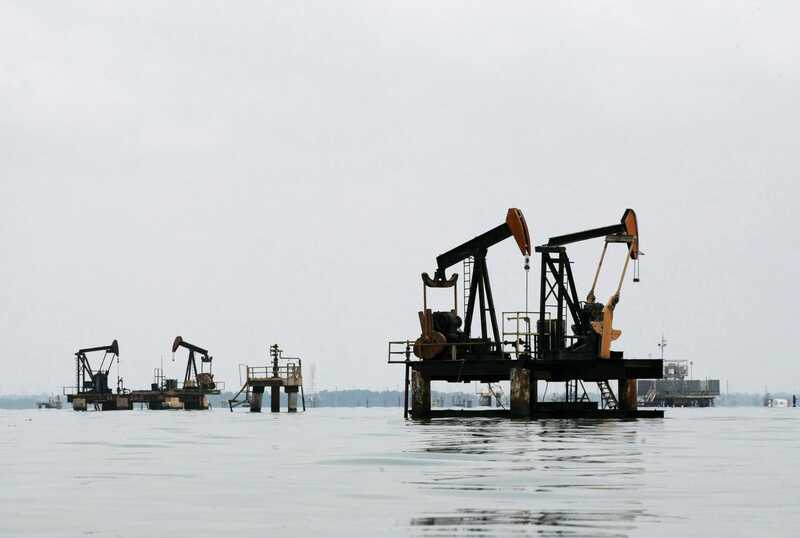 Oil pumps are seen in Lagunillas, Ciudad Ojeda, in Lake Maracaibo in the state of Zulia, Venezuela, March 20, 2015. Although the government has even started rationing those, kicking people out of line based on the last digit of their national ID card. And it's only going to get worse. That's because Socialist president Nicolás Maduro has changed the law so the opposition-controlled National Assembly can't remove the central bank governor or appoint a new one. Not only that, but Maduro has picked someone who doesn't even believe there's such a thing as inflation to be the country's economic czar. "When a person goes to a shop and finds that prices have gone up," the new minister wrote, "they are not in the presence of 'inflation,' " but rather "parasitic" businesses that are trying to push up profits as much as possible. According to this — let me be clear — "theory," printing too much money never causes inflation. And so Venezuela will continue to do so. If past hyperinflations are any guide, this will keep going until Venezuela can't even afford to run its printing presses anymore — unless Maduro gets kicked out first. But for now, at least, a specter is haunting Venezuela — the specter of failed economic policies. Read the original article on The Washington Post. Copyright 2016. Follow The Washington Post on Twitter. You need to have the Adobe Flash Player to view this content. Please click here to continue.